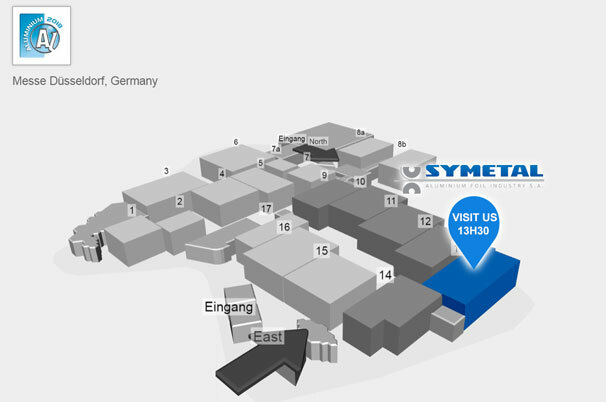 Symetal participates in ALUMINIUM 2018 - 12th World Trade Fair & Conference, which will be held from 9 to 11 October 2018 at Messe Düsseldorf, Germany. ALUMINIUM is the world's leading trade show and B2B-platform for the aluminium industry and its most important application areas. All significant players of the sector get together: The trade show connects producers, processors, technology suppliers and users along the entire value chain. It is the perfect place to get in touch with and develop new target groups, especially with engineers and designers from the application areas. Visit stand 13H30 to meet Elval (aluminium rolling division of ElvalHalcor), its subsidiaries Symetal S.A. and Elval Colour S.A., along with Bridgnorth Aluminium Ltd. and Etem, know their products and solutions, discuss and discover how they can best suit your needs. A team of qualified experts from Symetal will be present to highlight the Company’s extended product range, which includes aluminium foil products, both plain and converted. See you @ Düsseldorf in October 2018!